If you modify the sound detection, you will need to remap the lip-sync to your animation—see Mapping the Lip-Sync Detection. Double-click the sound layer name in the Timeline view or the sound column header in the Xsheet view to open the Sound Element editor. In the Sound Element section, drag the frame slider to the frame you want to change the mouth position assignment on. To change the image assigned to the frame, click on the image of the mouth position you want from below the preview image. The preview image changes to the mouth position image you select. You can perform the same operation in the Layer Properties view. Right-click in the cell that contains the mouth position you want to change. From the pop-up menu, select Lip-Sync > Change Mouth Shape to and choose the letter that reflects the mouth position you want to use for that sound. 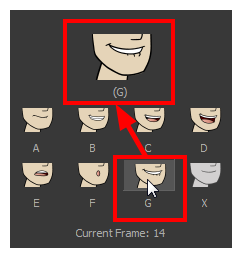 You can also select Animation > Lip-Sync > Change Mouth Shape > the desired mouth shape from the top menu. NOTENote that if you modify the lip-sync detection you must remap the detection to your mouth layer.